I can see that Focus Merge should work in AP - I've seen the Tutorial. I have a Panasonic TZ 100 which can do Focus Merge in the camera - but I'd prefer to do it in software if possible. AP should do this. The only slight issue I've noticed is that the camera generates MP4 files with a number of frames, so it's not quite in the form required for AP. It's not necessarily a big problem, though it could be a time consuming irritation. I can use either iTunes or FCPX (Final Cut Pro X) to pull out the frames and create individual shots to merge, but it would be a lot quicker if there's a tool which will do this straight off. I recall asking the Panasonic support people about this, but I haven't noticed a reply yet. Has anyone figured this out, or used this? Presumably for best quality it would good to shoot in 4k in burst mode, though getting the different focus settings might not be so easy with this camera. I think the Post Focus feature which generates the MP4 files only works with 1080P HD files. That raises another quesion - is it possible to mix resolutions with the stack functions - which could be a way of getting higher quality in the final result? I've managed to find a sample MP4 file thats was created using another Panasonic camera that has the same focus merge feature. Affinity Photo can't directly open these files, so you'll need to use a third party app to extract the frames from the video. Lightroom should be able to, if you don't have an Adobe subscription you can also try MPC-HC which is free to download (Windows only). Once you've extracted the frames, they can be added to the Focus Merge feature in Affinity and the app will create the merged image for you. I believe you can also extract the frames direct on the camera to save to the memory card. But it did indicate that it may shoot in 4K but the saved image maybe of lower quality. Thanks for checking this out. Fortunately (!!) I don't have a Windows machine, so the MPC-HC option won't work for me, and I don't have an Adobe subscription nor Lightroom. There may be other tools which will work with Mac OS, or possibly Linux. For occasional use video tools should do the job - hopefully well enough. Others may be grateful for you mention of MPC-HC etc. `i haven't fully figured out the 4k aspects of the camera, including video and still shots. I think that for hand held shots any quality benefits of 4k are often countered by camera shake, though the Post Focus feature which generates MP4s does I think use 4k internally. I haven't yet been blown away by any 4k shots of my own though the reviews suggested that I might be - but I've not tested it to extremes yet. It should be possible to take a sequence of 4k shots, though I can't remember whether this camera has focus bracketing. I'd have to read the manual yet again. It does have exposure bracketing I'm fairly sure. The Post Focus videos certainly do contain frames which are differently focused, so should work quite well with AP once the frames have been extracted - even if only to produce an HD quality image. I may have misread your last sentence about extracting frames from the camera. It is certainly possible to do various forms of merge on the camera, then export the results. I'm not sure if it's possible to extract individual frames. I didn't know what the camera would actually do, and I only found out about the MP4 files by taking the memory card out and reading it into my computers. I did not know what to expect - but the only files I've seen so far have been MP4 video files. I could inspect those further to see what internal codecs have been used etc. 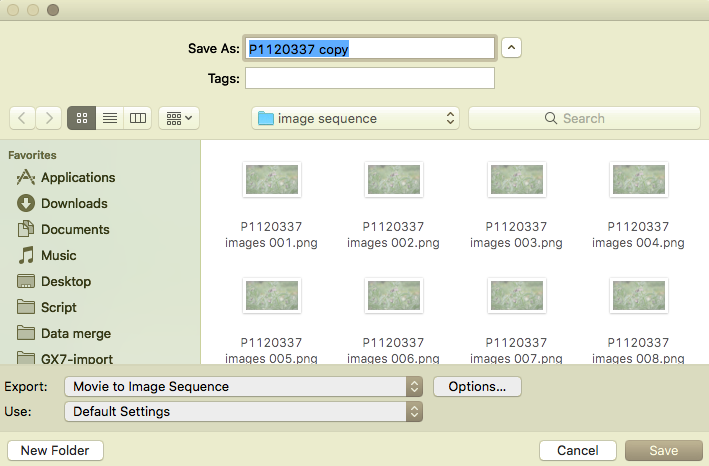 i have explored this further - how to get an image sequence from an mp4 file. Blender can do this quite well, though it's a bit awkward to figure out. In my case - using a Mac - I used Blender to import an mp4 movie, then I exported using the Animation feature to create a sequence of images. I'm not as familar with Blender as I'd like, but it appeared that these png files were stored in the /tmp folder - which of course is somewhat hidden at the top Mac OS X level. I went into Terminal, and then looked at the /tmp directory to see the files were there. Then I created a new folder on my desktop (back in OS X mode), then in Terminal I issued a cp *.png command - which I completed by dragging the icon for the newly created folder back into the Terminal. When I clicked on return the image files were copied to the folder I had on my desktop. From there I was able to use Affinity Photo to do a focus merge. I think my kludge step to copy the files isn't actually needed by anyone more familiar with Blender. There are other ways to get an image sequence from mp4 files, but right now Blender seems - with some quirkiness and difficulties about the unfamiliar user interface - to actually be quite easy and quick. This one contains a video towards the end which shows how to do this. Maybe this will help others who want to try this. Have you tried merging several still images to get a panorama? It may be more hassle at the time of shooting, but less hassle when it comes to post-processing. Affinitiy's panorama stitcher can cope with moderate mis-alignment. I haven't deliberately tried to create a panorama that way, but I discovered that AP can use stacked frames and generate larger images by accident while doing other things - though sometimes it becomes a mess. I have tended to concentrate on focus merge, and HDR merges, and even merges to reduce image noise. Trying to redo this with Blender is surprisingly non-trivial. It's not that the software can't or won't do the job, but rather that the interface has so many different features it's hard to get it right every time. Practice makes perfect they say, but one shouldn't have to work at things this hard so often. It's also hard to see the Blender workspace on smallish laptop screen, compared to a much larger desk top screen. It really would have been great if Panasonic had provided decent software to deal with this outside the camera. Failing that maybe Affinity could address the issue of importing short video files in a format such as mp4. Number of frames required for stack. There shouldn't be any need for AP to do any more than handle short clips, as video files can be trimmed using other tools. Perhaps given the constraints on ease of use, the simplest solution would be to copy the SDHC card onto a dupicate/working space card,then use the in-camera editing to extract the required files. Some people might find that less painful than using software outside the camera. I would perhaps also have written that it is best not to use 4k modes, or Post Focus modes with the TZ100, but recent experimentation suggests that it is better to use those modes to capture acceptable shots, rather than to use high resolution/RAW shots which should ideally be well in focus, but in practice often aren't. In theory it should be possible to get better shots using the highest resolution and RAW mode with the camera, but high resolution shots which are out of focus are actually worse than lower resolution ones, with at least some parts of each image in focus. So I'm reverting to the view that 4k and Post Focus shots may have advantages with the TZ100 camera. Users will have to experiment and find what's best for them. Or at least, it can with a QuickTime Pro licence. I'm not sure if this functionality is available in QTP7 unless you also have the licence, which as far as I'm aware Apple no longer sell. I bought one a few years back, and I think it may still be valid. I think you are right about needing the 'pro' license (which I bought many years ago before there were Intel Macs). The app still works fine on my iMac but unfortunately, from what I have read Quicktime 7 won't work with future versions of macOS (anything after the current High Sierra version) because it is a 32 bit app & Apple has said that High Sierra is the last macOS version that will run 32 bit apps, period. I am gradually finding a work flow with those MP4 files which works for me. It's a bit tedious, but does "the job", providing the job is simply getting the "best" image from the MP4 sequence. It does not improve the focus over the whole imaage. Looking at the MP4 files in Quicktime it is quite surprising that often some of them are completely out of focus. Some are indeed, as one migh hope, capturing different parts of the images in sharp focus. I don't know what algorithms Panasonic use inside the camera to sharpen the focus - that does generally seem to work quite well, though I think it's only supposed to sharpen the focus on user selected parts of the whole image, which again is not quite the same as focus stacking. My current solution is to view the image sequence in Quicktime, and scan through to find an image which looks the best for the intended purpose. Then put QT into full screen mode, and wait until the forward/reverse markers disappear. Then use the key combination cmd-shift-3 to save the screen shot. The resulting file can then be adjusted further using AP. If one wanted to do more work on the whole it might be possible to extract several frames with slightly different focus by this method, and to use a focus merge stack in AP. I don't do that at present, but I do often "optimise" the image by adjusting the levels, using a curves adjustment to get a further perceptual improvement, and possibly applying an amount of sharpening. Sometimes, to my surprise, blend modes give a pleasant result, though this is quite often a trial and error process. While this seems to be a somewhat clunky process, it does work quite well for images taken in landscape mode. Portrait mode is slightly more difficult, as AP might not do the 90 degree rotation so well - truncating part of the image - so if that happens I use other tools, such as Preview to get the rotation done. I do also use crop to get horizontal (or vertical) lines into the clossst approximation to the "correct" position with the straighten option.